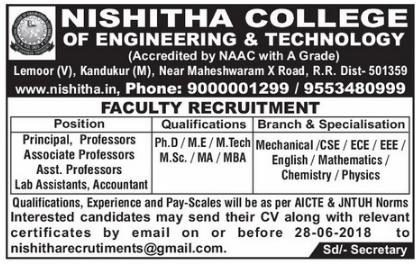 Nishitha College of Engineering and Technology, Ranga Reddy has advertised in the EENADU newspaper for the recruitment of Teaching Faculty- Professor / Associate Professor / Assistant Professor / Principal Plus Lab Assistants / Accountant jobs vacancies. Interested and eligible job aspirants are requested to apply on or before 28th June 2018. Check out further more details below. About College: Nishitha College of Engineering & Technology,(NSHT) is located in a hygienic environment beside National Highway 09, near Shamshabad Airport in Hyderabad of Telengana State. The Institute was established in 2003 with a moto to play a pivotal role in the development of the intellectual capital in Engineering fields, especially in electrical, electronics, computer & Mechanical.